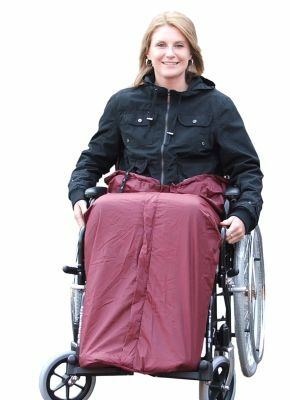 Wheelchair Clothing Kozze Toze THERMA-FLEECE lining. The Kozee Toze has been specially designed to offer maximum comfort, warmth and protection. They will fit all wheelchairs and are suitable for both ladies and gentleman. The ‘THERMA-FLEECE’ lining ensures a warm, comfortable and draught proof capsule. The Kozee Toze provides a draught and shower proof environment, to offer you the equivalent of fireside comfort in your wheelchair. The full length ring pull zip ensures easy access to the cover, while the extended back panel prevent drafts to the spine and the reinforced foot space provide a wipe clean surface and prevents scuffing, so ensuring a long life. Staying warm makes every movement easier. The Kozee Toze will keep you warm even on the coldest days, helping circulation and ensuring that every movement is easier and less painful. The ultimate in outdoor protection. The Kozee Toze is as important as the wheelchair for your comfort and protection. Very nice. I live in Sweden. The price is very good for me even if I have to pay more for the shipping. The problem is that the person who sits in the wheelchair has to rise when you put it in the chair. Not easy. Maybe the design could be better. The qualite is good, warm and cozy. Lovely and cosy in the colder weather. Easy to get in and out of, but it needs tough elastic at the back so that this can go over the back to the seat of the scooter to hold the Kozze Toze in place whilst getting into it; it also slips whilst in use without something to hold it in the right position. I tried tying extra elastic to the loops sown onto the item, but the loops came off. I have now sown thick elastic to each corner of the back so that it fits snuggly over the back of the scooter - very satisfactory now. Great product easy to put on and lovely and warm,item well packaged with fast delivery..